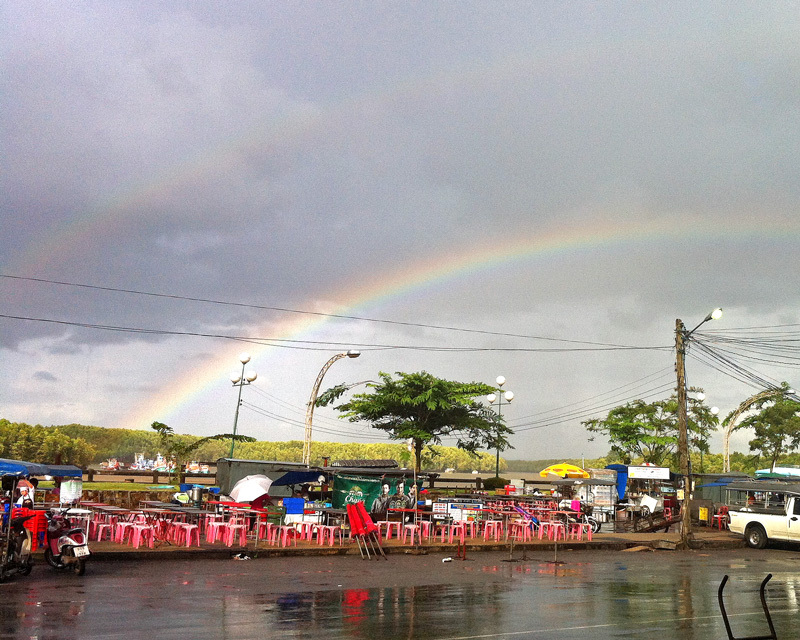 Krabi Town – like any Thai town – has its fair share of markets. It was here that we learnt to love markets. There are four regular markets we want to introduce to you. If you end up staying in Krabi Town even just for a little while, go seek them out – at least some of them. To help you not miss out on the wonderful market gems Krabi Town has to offer, we linked the names below to their location on the map. 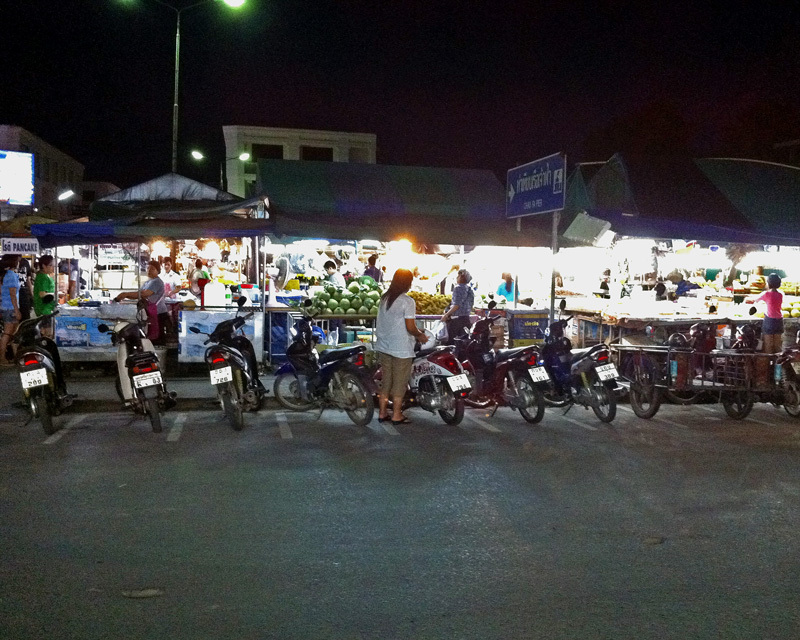 The city market (sometimes also called night market) is probably the most prominent market in Krabi Town. You will most likely just come across it wandering around without even specially seeking it out. It is located on Sukhon Rd between Uttarakit Rd and Maharaj Rd (link to map location in title). Vendors start setting up around noon but things don’t really get started until around 2pm and until 8pm. 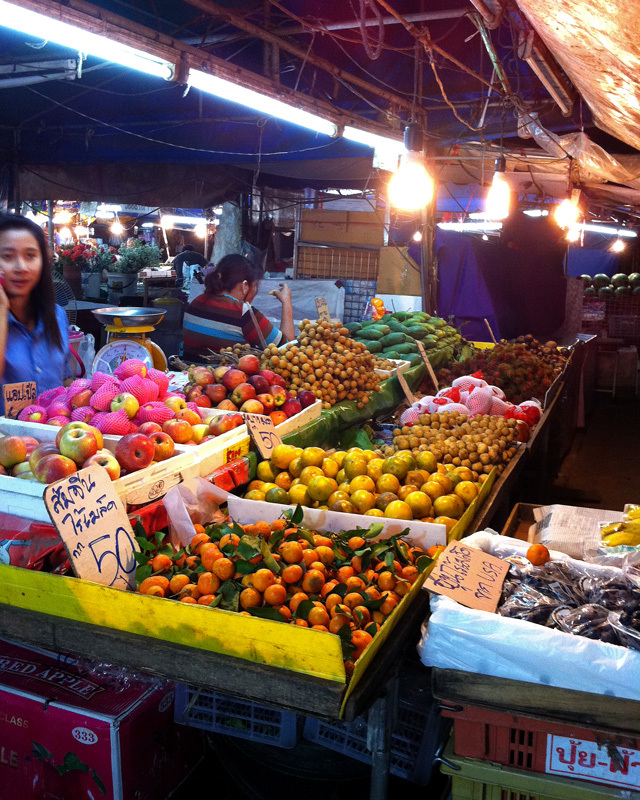 At the city market you can find an abundance of colourful, fragrant and very tasty fresh fruit. The varieties range from familiar oranges, bananas and apples. 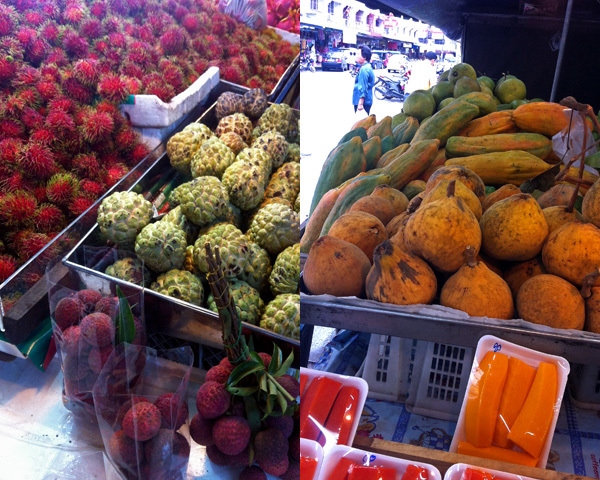 But also fruit you probably haven’t seen before, like rambutan, longan, mangosteen and custard apple. 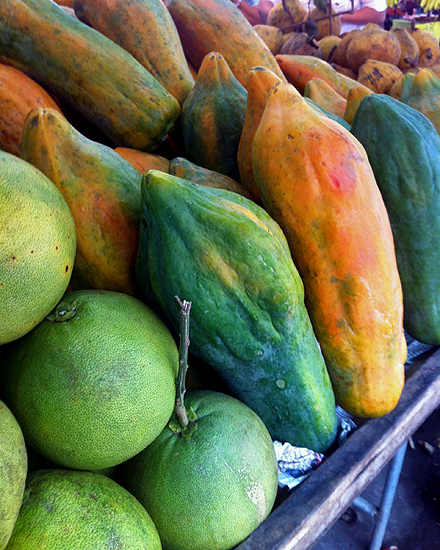 Be adventurous and try some new fruits here. The super sweet Thai pineapples or juicy green mangos (orange on the inside) shouldn’t be missed. Towards the back you can also find vegetable vendors but unless you are cooking for yourself these might not be too relevant. You can also find a lot of prepared food at the city market. 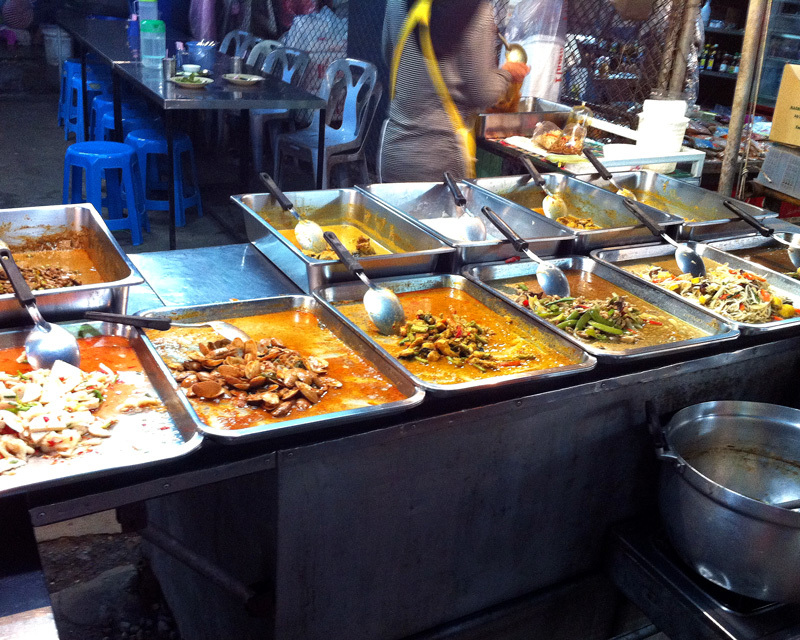 Rows of serving dishes filled with all kinds of fragrant curries and other local specialties. You can eat right there but many locals take the curries ‘to-go’ in plastic bags to eat at home with steamed rice. If you are looking for dessert afterwards, try colored sticky rice with mango, or rice cakes. Towards the back on the left hand side there is a lady selling the most amazing coconut-corn waffles. These things are like crack – I tell you. Konrad’s sister tried them when she visited us in Krabi over a year ago and still mentions them once in a while. You won’t find any raw meat here, making it a rather pleasant smelling market. In our experience prices are really great here, so no one is haggling. (Haggling for food doesn’t seem custom anywhere in Thailand). This is the place to go for eating freshly prepared Thai food – we got to know and love Thai food here. It is located at Chao Fa Pier by the riverside. The night food market starts around 6pm and is open until 11 or midnight. In the afternoon vendors start setting up their stalls on wheels and small tables with plastic stools for customers. Don’t be fooled by the low-key setup. You can find some most amazing meals here. The stalls on the left hand side are reserved for Muslim vendors serving Halal food. You won’t find pork here but don’t miss the awesome Roti (Thai pancakes). With time one specific vendor became of favourite. Look for a skinny, very energetic middle-aged cook. But before you find him, his wife will probably have found you and urge you with a big smile to “Sit Down!”. Her selling points are the very cold beer and spring rolls. They really are good! The vendors here actually do have menus, so after you sit down and decided what to have, you will write down the corresponding number on a piece of paper. Drinks are served really quickly, but depending on how many other customers there are, the wait for the food varies. (During highest high season we had to wait over an hour once but that’s very unusual). 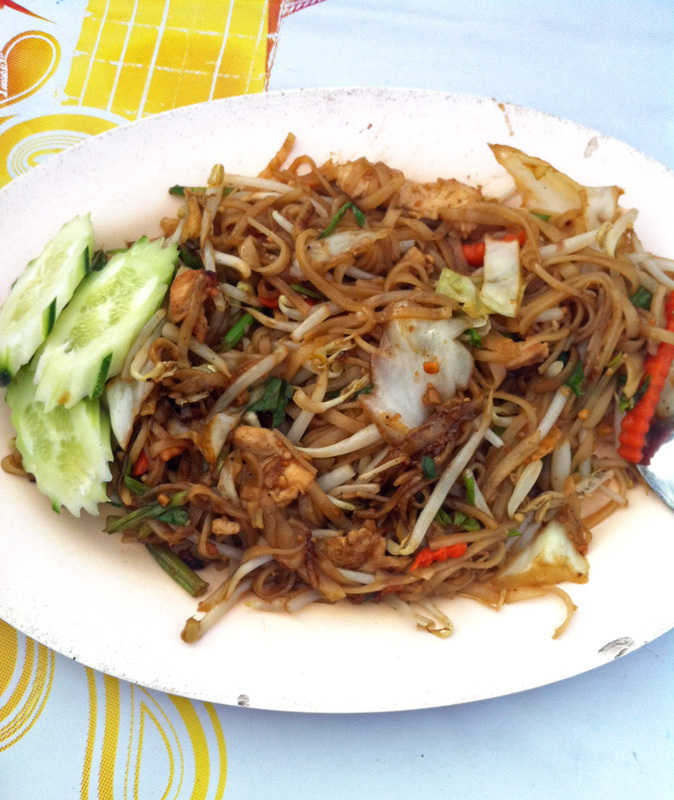 Our favourites here are Pad Thai (with chicken for me, vegetarian for Konrad) or the cashew nut fried rice with chicken. Feeling retro? 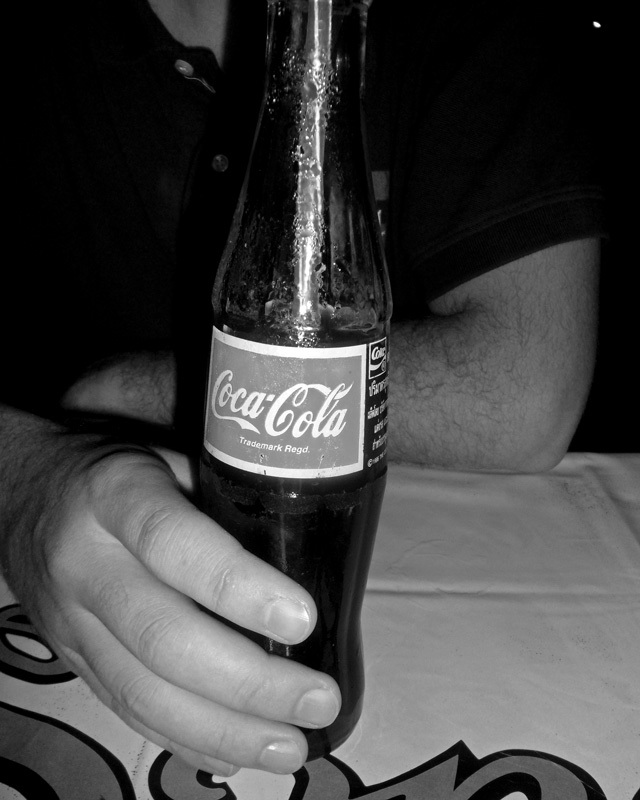 Have a soda from a glass bottle. If you would like to try some fresh seafood and fish, there is a vendor grilling awesome fresh fish on the far right. You can even get your fish there and sit down with another vendor for your rice or noodles. The prices here are very reasonable starting at 30 Baht for a plate of food. We have had some feasts for 2 for under $5 at times. 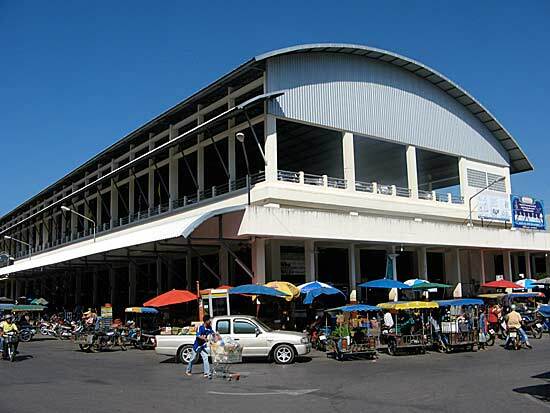 The morning market is a huge wholesale wet market located in a roofed building. Things get started very early here but between 7-8am is a good and reasonable time to go for visitors to Krabi Town. After that things will start to die down slowly. There isn’t much you can’t find here. Around the outside of the building all the fruit vendors have set up shop. As you move in there are rows and rows of vegetable sellers and then you start coming across the raw meats. In the main building there are only chicken and fish vendors. Pork and beef are confined to their own separate buildings. There is also a cooked food section with savory and sweet foods – a good place to try local breakfast. At the back you can find all sorts of rice and even clothing for sale. Even if you don’t want to buy anything specific, coming here just for the experience is worth it. 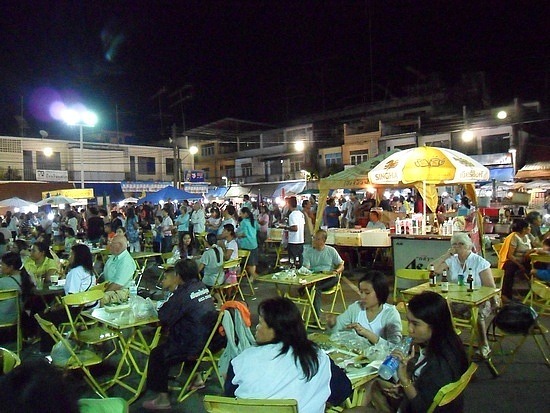 Krabi Town has its own Walking Street market. On weekend nights (Fri, Sat, Sun) the street behind Vogue Department Store is shut down for this market. The Walking Street is centered around a stage where local artists perform or Karaoke is going on. In front of the stage there are many tables and chair, where you can sit down to enjoy some of the many great foods for sale at the stalls around. The Walking Street market has a distinct focus on local crafts and vendors. Aside from food you can find art works, handmade jewelry, souvenirs and clothing. You can also treat yourself to a relaxing foot massage or a cheap manicure. If you happen to be in Krabi Town during the weekend, don’t miss the Walking Street. I’m so glad you’re profiling THE different Thai markets here. Markets are great, they reveal so much about local food and culture. We are glad this post brought back happy memories for you, Peter! That curry looks absolutely amazing. The aromas of all the different curries together was amazing as well. Enjoy. How long you in Krabi for? We’re missing the beaches already and will be spending some time there later this year. Brilliant post! 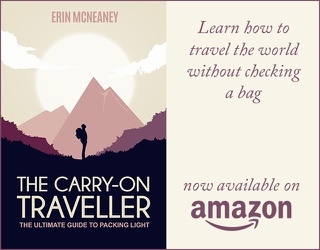 This is a terrific resource – thank you very much for sharing your knowledge in such an engaging way. 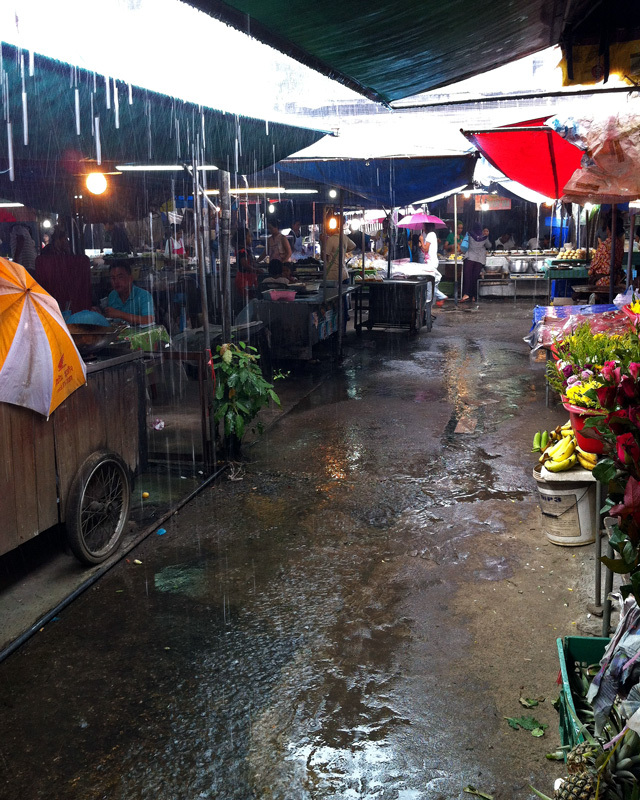 Will certainly visit some (if not all) of these markets when in Krabi. When will you be in Krabi? Mate, we’re heading over in March. Visiting Krabi Town, Ko Phi Phi and Railay Bay. Really looking forward to the experience: scenically, culturally and, of course, the cuisine! If you’re there around that time, let me know – would love to meet and share a few Changis!